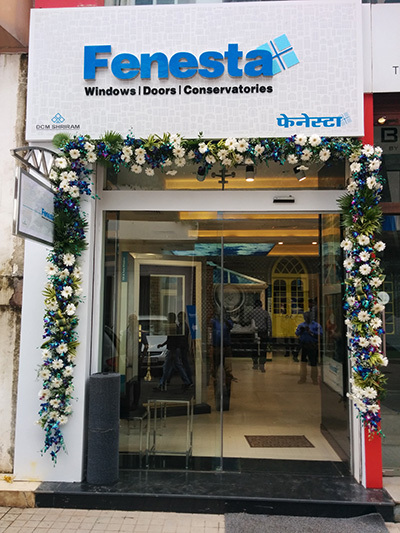 Fenesta Building Systems, India’s largest windows company and a division of DCM Shriram Ltd. is expanding its retail reach in the country. The company announced the launch of its Signature Studio at Raghuvanshi Mill Compound, Lower Parel in Mumbai today. The new Signature Studio will change the way of buying windows and doors for the Indian consumers as the customers will be able to touch and feel the product before the purchase. The studio showcases the Fenesta range of products…. windows, doors, conservatories and their various design and color possibilities. Composite doors suitable for exterior as well as interiors are on display in attractive colors and also a life size conservatory to give the consumers a real experience of the product. The design team at Fenesta uses a special software to help the customer visualize and create unique, customized solutions suitable for any type of façade…. villas, apartments, penthouses, hotels, hospitals, schools and etc. Fenesta is committed to its customers to provide impeccable end-to-end services. Fenesta is the only company in India to control the entire supply chain starting from making of UPVC that goes into making of the profile, to installation of end product, as well as after sales service. The range of products is specially designed in UK and Austria to give consumers a well-engineered but contemporary style. The products at Fenesta go through stringent tests and quality check at every step to ensure performance in India’s varied and extreme climates. Fenesta products are immensely popular amongst leading builders, architects and interior designers across the country for its noise insulating, rain proof, dust proof features without compromise on aesthetics. Fenesta Signature Studios will be soon coming to other cities in India including Ahmedabad, Chennai, Hyderabad, Kolkata, Pune and Bangalore. Last month Fenesta launched its Noida and Gurgaon studios for the Delhi-NCR market. Fenesta is a division of the Rs.6400 Cr conglomerate DCM Shriram Ltd. Fenesta is India’s largest windows and doors company. It has installed more than a million windows and doors across nearly 150,000 homes. Empowered with the knowledge of India’s extreme conditions, Fenesta has designed UPVC windows and doors that are able to withstand India’s extreme climate. Headquartered in Gurgaon, Fenesta has its own sales and service presence in nearly 50 cities with 4 factories and 100 showrooms. With Fenesta, the customer is assured of end to end service starting from selecting the right designs, site survey, fabrication, delivery and installation. As a leader in the category, Fenesta takes pride in its ability to serve individual homes and large developers with equal ease.